A neat thing happened after our retreat this year. Quite by accident we were able to keep some of our retreat momentum going. I had taken a lot of photos at the retreat (with the intention of sharing many of them with you). I realized after we returned that we didn’t have a way for our ladies to share their photos easily with each other. 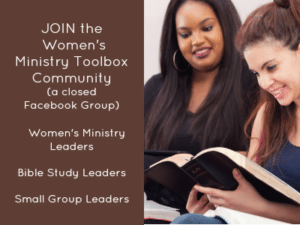 So I quickly put together a closed Facebook group for our women’s ministry. 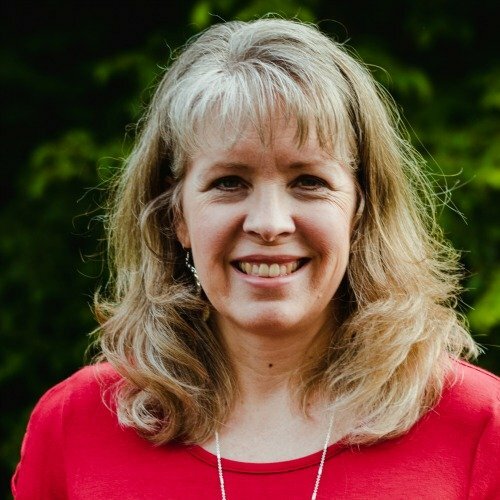 I invited all of the women I knew that had been at the retreat. I uploaded the photos I had taken and invited others to do the same. I had no idea that they would enjoy seeing the photos so much! Many went through a commented on several of the photos. There were lots of “likes”. Some of our gals added their own pics. For well over a week we were reminiscing and holding onto the spiritual high we had experienced. Our gals were posting and challenging one another to apply lessons we had learned. Another shared that our theme song had played on the radio while she was driving to work. Ya’all it was so sweet. We may not have been together any more in person, but we were able to bond and extend our retreat experience. Put together a slide show or video and show it the next weekend at church. If you are allowed to do so. Encourage your discussion groups to meet for dinner one night in the month following the retreat. 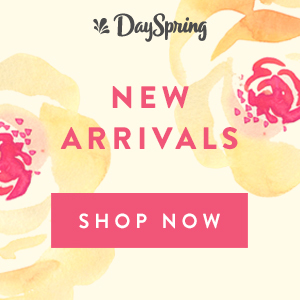 Plan a women’s ministry dessert or potluck with a time of reflecting on the retreat. Let women share what’s stuck with them. Put together a slide show or video to share. 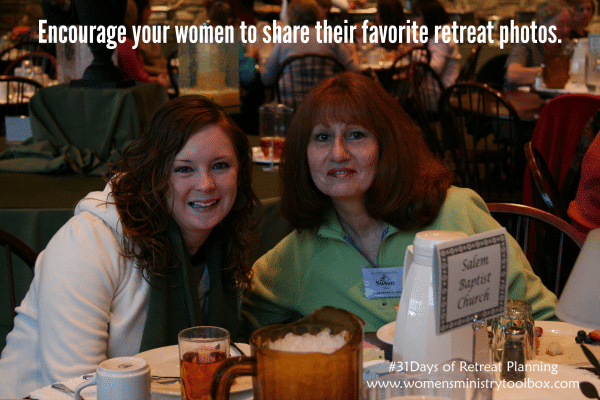 Share YouTube videos of the songs you sang at the retreat on your women’s ministry Facebook page. 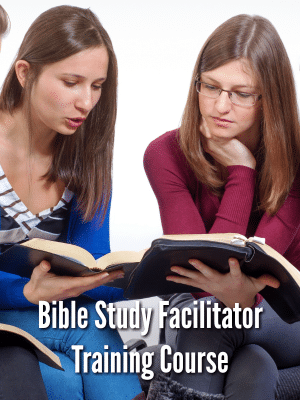 Offer a Bible study on the same topic of your retreat. Now I know not all of your women were able to or chose to attend the event. However, when they get a glimpse of what they missed, they may be more likely to attend the next time. You also want to be careful not to “rub their nose in it”. Some of your women had very serious reasons for not attending and you don’t want to make anyone feel bad for missing the retreat. 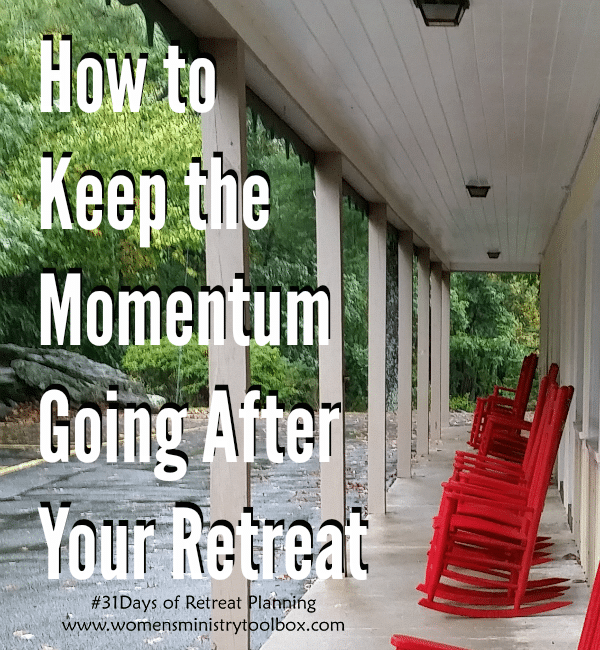 What other ideas do you have for keeping the momentum going after your retreat has ended? Gloria, I am so glad you shared this! What a fantastic idea! Thank you! During our last retreat, we had a poster activity that was central to each lesson. At the end of the retreat, I took a picture of the poster and when I got home I worked it into a postcard-sized bookmark. It included a picture of the poster with a couple of sentences summarizing the teachings from the sessions. At the two week mark, I wrote a letter to the ladies who attended and reminded them that the retreat may be history, but our God is not; and what He taught us during that time still remains. I included the bookmark for their reference. Every lady who received one was thoroughly touched. It was very effective.